Carausius, AD 286 to 293. AE antoninianus. 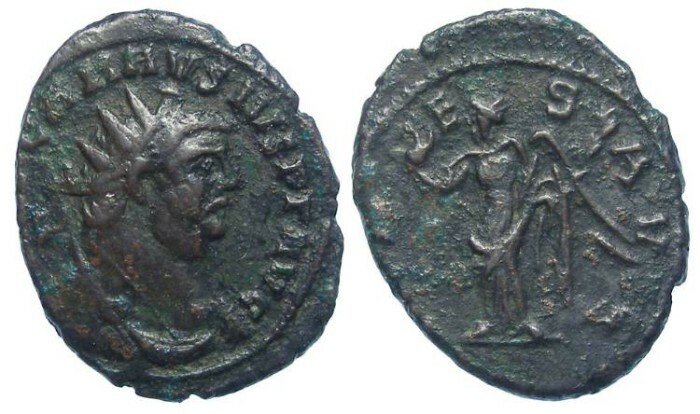 Denomination : AE antoninianus. Mint : no mint mark, assumed to be London mint. Size : 19.8 x 24.3 mm. Weight : 4.41 grams. Reference : RIC V, pt. 2, #747. Grade : VF with a brown patina with some encrustations on the reverse. The flan is oval so parts of the inscriptions are off the flan. Obverse : Head of Carausius right, with IMP CARAVSIVS P F AVG around (the first couple of letters are off the flan) . Reverse : Victory standing left, holding wreath and palm, with COMES AVG around (the first three letters are off the flan). There is no mint mark on this coin, and while the mint of issue for these is not certain, it may have been London.